This is the first book to appear on the topic of Ambulatory Assessment, a new approach to behavioral and psychophysiological assessment. The ambulatory assessment approach is based on "naturalistic" observations and measurements made during everyday life, and has high ecological validity. This also means that ambulatory assessment techniques are ideally suited for practical application in a wide range of fields. Individual differences in behavior and physiology, as well as behavior disorders, can be investigated in real-life situations, where the relevant behavior can be studied much more effectively than in the artificial environment of the laboratory. 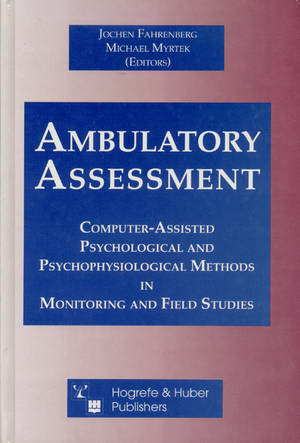 In this book, 24 chapters from an international group of researchers provide a comprehensive overview of the state-of-the-art in ambulatory assessment. The most recently developed methodologies are examined. Their use is then illustrated with numerous examples of monitoring and assessment, both in the workplace and with patients, and including the pertinent hard- and software components. Important research findings, some of which challenge theoretical positions that were based on laboratory observation, are also presented.